Vehicle vinyl lettering for Chicago area businesses is no longer just for plumbers, landscapers and electricians. In fact, there are plenty of other businesses that send representatives to visit customers. Some of these professionals have caught on to the superior success that contractors have had with automotive lettering and decals. As a result, they are now also getting in on the action. Case in point is DMN Global Services. In the business of telecommunications network engineering and the services that go along with support and installation, routine maintenance and site surveys, the company’s headquarter is located at 56 Huntcliff Court in Fox River Grove. Its clients, however, are situated all over the area. Getting to them with a well-stocked Chevrolet Express van, the company’s management team realized that the bland white color of the vehicle did nothing to brand the business. After they contacted Mark Your Space for assistance, we went to work. 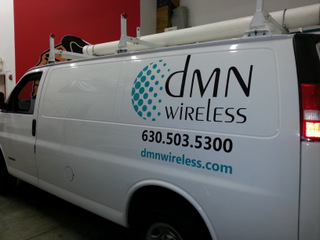 Now, the work van uses the white color as a backdrop for DMN Global Services’ company name and logo. 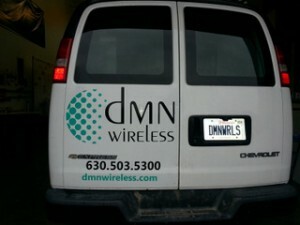 Advertising its wireless division, the van displays the company’s website and telephone number on the back doors. This information is repeated on the rear third of the van’s sides. Whenever this automobile is in route to an appointment or parked in front of a client’s residence or business, the company is marketed to passersby. 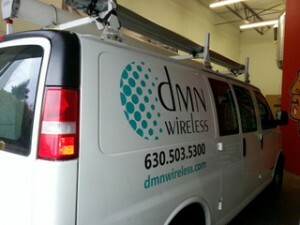 Vehicle vinyl lettering for IT companies in Chicago can work for your business, too! Branding. Get your business logo out there. Have it become synonymous with excellent customer service in the IT niche. Marketing. Have you recently added a new component to your service? For example, do you now provide inbound technical support in addition to installation and routine maintenance of the equipment? Have you perhaps added a new product line to your menu of services? Choosing vinyl vehicle decals to display this information will help with targeting current customers as well as members of the niche that you serve. Name recognition. Build name recognition simply by having your name and logo displayed. Since IT companies are increasing in number, it stands to reason that particularly newcomers to the business need to find a way to stand out quickly or risk their companies’ profits. Nothing builds name recognition faster than a movable billboard that drives all across town and particularly in the areas where the business’ target demographic lives and works. It is virtually impossible to reach as many consumers with any other means of advertising. Sure, you could create a cable television commercial and even buy some ad space in the newspaper, but are you reaching your customers and target demographic? With the treated van or truck, you have the opportunity to be actively seen in the neighborhoods that you serve. Be seen in business parks where you hope to do business with local companies! Pinpointing and targeting your marketing campaigns has never been easier. Contact our experienced vehicle vinyl lettering installers today to get started on your design. We work with you on choosing just the right display elements and spacing. In addition, we can help you decide if you want to go with a lettering and decal setup, add a window perf or perhaps go for a full vehicle wrap.